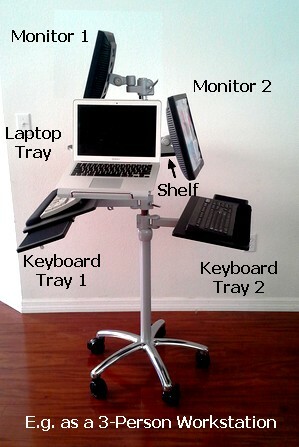 - Height adjustable: both, the laptop tray AND the pole are height adjustable. 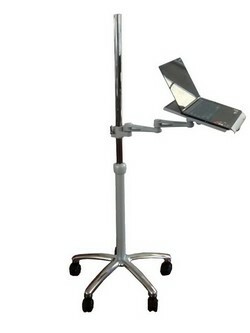 The laptop height is easily adjustable along the upper pole (chrome section), so you can use this pole cart in standing or sitting position (lowest: 31" from floor). Simply untighten the handle screw on the pole-clamp, select you desired height, re-tighten and done! 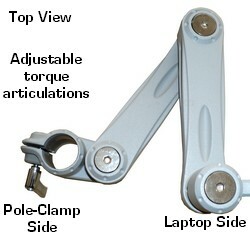 The upper pole itself is also height adjustable. Note: For sitting operation, the lowest setting will have the laptop tray at 31" from the floor, so please check if this setting is too high for your sitting comfort (many tables are only 29 - 30" tall). 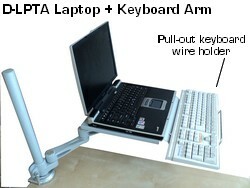 - Use a keyboard in front of the laptop: includes a retractable support to add a keyboard tray in front of the laptop. - Customize your Laptop Station: add extra parts to create a full mobile workstation, such as a LCD monitor mount or arm, a shelf or a full keyboard tray. Please contact us with any special configuration you might need.